For the most blessed of souls, March Madness brings hundreds, even thousands, of dollars. The stakes can be high in bracket contests for the NCAA men’s basketball tournament. To the smart – and lucky – pickers go the spoils. This year, a local church is offering a different kind of grand prize: a waterproof Bible. Not waterproof to repel tears of joy if the Buckeyes win or sorrow if they lose, but rather a Bible that’s “handy for camping trips or other manly adventures,” according to a news release touting the prize. 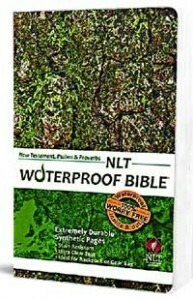 The New Living Translation Waterproof Bible is made of durable pages that won’t tear or stain. “Part of our MO is to try to be engaged with the things that are important to men, that are of interest to men, (and) sports is a big one,” said Beau Stanley, pastor of Grace Brethren Church on the Far North Side. Stanley writes a blog for the men’s ministry at the church. The brackets contest is aimed at attracting more men to the blog. A “Y” chromosome is not a prerequisite for playing. Neither is church membership. The brackets can be filled out online, and participation is free. Only eight people had signed up by yesterday, so the chances of winning could be a lot better than in an office pool. Playing for a Bible helps keep things in perspective, Stanley said. A huge fan of the Buckeyes, he admits that he’s gotten so wrapped up in a sporting event that he’s prayed for the outcome, even though he knows that’s ultimately unimportant. To join the quest to win the Bible, go to www.thefrontieratgrace.com.